Only the best sites are voted to receive the Golden Web Award. The criterion for winning remains a challenge to even the best Webmaster, artists and designers. That being said, the primary benefit of the Golden Web Award is the recognition of your commitment to the pursuit of website excellence. Further, it represents that your work is considered an outstanding website, incorporating high standards of design, originality and content. Most importantly, the Golden Web Award lets others know your viewed as a respected professional by your peers, one who is deserving of recognition. My heartfelt thanks to all the folks who felt that MKOC merited such praise. Please take time to visit these wonderful sites! But don't forget to come back! Your graphics, layout and overall presentation are superb and more than deserving of this prestigious Award. Congratulations and looking forward to viewing more of your work. Thanks to Thomas Leary of Mule Dog Records for presenting me with this wonderful certificate. 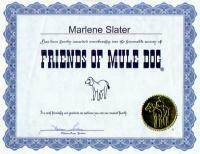 This is only a small scan of the original which Thomas mailed to me for framing.. gold Mule Dog Seal and all! Click on the certificate to see a larger version. I'm very proud of this award! 2Steppin quote: "Congratulations from the entire staff of 2Steppin'.... you are our March 1998 winner of the "No Bull" award. A link to your website will be added on our "winners" page. We certainly can respect the amount of time you must spend working on your website and we also admire your support of new artists and, now, the Child Protection project.